Weblate 2.4 has been released today. It comes with extended support for various file formats, extended hook scripts, better keyboard shortcuts and dozen of bug fixes. Improved support for PHP files. Ability to add ACL to anonymous user. Improved configurability of import_project command. Added CSV dump of history. Avoid copy/paste errors with whitespace chars. Added support for Bitbucket webhooks. Tigher control on fuzzy strings on translation upload. Several URLs have changed, you might have to update your bookmarks. Hook scripts are executed with VCS root as current directory. Hook scripts are executed with environment variables descriping current component. Add management command to optimize fulltext index. Added support for error reporting to Rollbar. Projects now can have multiple owners. Project owners can manage themselves. Support for adding new translations in XLIFF. Improved dictionary matching for several languages. Improved layout of most of pages. Support for adding words to dictionary while translating. Added support for filtering languages to be managed by Weblate. Added support for translating and importing CSV files. Rewritten handling of static files. Direct login/registration links to third party service if that's the only one. Commit pending changes on account removal. Add management command to change site name. Add option to confiugure default committer. Add hook after adding new translation. Add option to specify multiple files to add to commit. You can find more information about Weblate on http://weblate.org, the code is hosted on Github. If you are curious how it looks, you can try it out on demo server. You can login there with demo account using demo password or register your own user. Weblate is also being used https://hosted.weblate.org/ as official translating service for phpMyAdmin, Gammu, Weblate itself and other projects. PS: The roadmap for next release is just being prepared, you can influence this by expressing support for individual issues either by comments or by providing bounty for them. Published on Sept. 20, 2015, 6:15 p.m.
Weblate is not only useful for translating software, it can help in translating any content. Let's look where our users are using it. Software translation is the most usual use case. This is actually where Weblate was used for first time and still provides great support for that. As an example (and oldest project hosted in Weblate) you can look at phpMyAdmin, where Weblate also helps to keep in sync translation for different maintenance branches. It can also help you in using same terminology in command line utility and graphical one like it is done in Gammu and Wammu translations. Weblate also supports localization of mobile application. Android support was originally implemented for OsmAnd project, but now they also translate iOS application using Weblate. Another use case is for translating documentation. You need to have some infrastructure to do, but there are several free software project to help here as well. For phpMyAdmin documentation or documentation for python module Odorik the Sphinx documentation generator is used, which has support for translation of the documentation. I've recently published quick howto for this setup. Another great tool for translating documentation is Publican, it is Docbook based tool and is used for translating The Debian Administrator's Handbook. Last but not least, you can use Weblate to translate your website. For example website for Weblate itself is translated this way. Did you miss your use case for Weblate? Please let me know. PS: I've heard that one Linux distribution will start using Weblate soon. Some time ago we've decided to move phpMyAdmin out of SourceForge.net services. This was mostly motivated by issues with sf.net bundling crapware with installers (though we were not affected), but also we've missed some features that we would like to have and were not possible there. The project relied on SourceForge.net with several services. The biggest ones being website and downloads hosting, issue tracking and mailing lists. We've chosen different approach for each of these. As first, we've moved away website and downloads. Thanks to generous offer of CDN77.com, everything went quite smoothly and we now have HTTPS secured website and downloads, see our announcement. Oh and on the way we've started to PGP sign the releases as well, so you can verify the download. Shortly after this SourceForge.net was hit by major problems with infrastructure. Unfortunately we were not yet completely ready with rest of the migration, but this has definitely pushed us to make progress faster. During the outage, we've opened up issue tracker on GitHub, to be able to receive bug reports from our users. On the background I've worked on the issue migration. The good news is that as of now almost all issues are migrated. There are few missing ones, but these will be hopefully handled in upcoming days as well. Last but not least, we had mailing lists on SourceForge.net. We've shortly discussed available options and decided to run own mail server with these. It will allow us greater flexibility while still using well know software in background. Initial attempts with Mailman 3 failed, so we got back to Mailman 2, which is stable and easy to configure. See also our news posts for official announcement. Thanks to SourceForge.net, it has been great home for us, but now we have better places to live. Published on July 25, 2015, 6 a.m.
Up to recently, the only social presence for Weblate was my personal Twitter account. It's time to change that. You can now follow news and information about Weblate on Twitter, Facebook or Google+. Weblate 2.3 has been released today. It comes with better features for project owners, better file formats support and more configuration options for users. Dropped support for Django 1.6 and South migrations. Allow to accept suggestion without editing. Improved support for Google OAuth2. Added support for Microsoft .resx files. Tuned default robots.txt to disallow big crawling of translations. Simplified workflow for accepting suggestions. Added project owners who always receive important notifications. Allow to disable editing of monolingual template. More detailed repository status view. Direct link for editing template when changing translation. Allow to add more permissions to project owners. Allow to show secondary language in zen mode. Support for hiding source string in favor of secondary language. 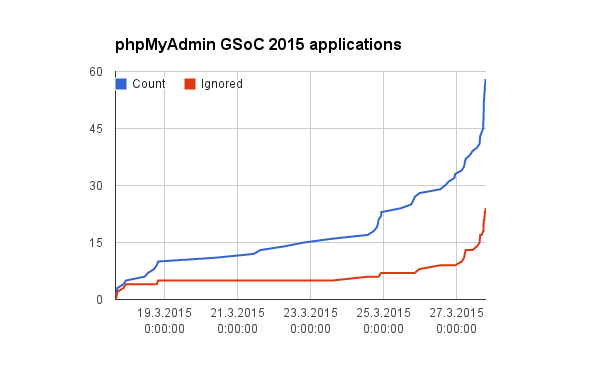 Published on May 22, 2015, 10 a.m.
As usual, I look at the application stats for phpMyAdmin just after student application period of Google Summer of Code is over. First of all we got way more proposals than in last years, but also number of bogus proposals went up (you can see them as ignored in the chart). Same as in past years, people leave the submission to the last moment, even though we encourage them to submit early so that they can adjust the application based on our feedback. But still we got more than half of the proposals in last three days. Anyway we're just working on evaluation and will finalize it in upcoming days. Of course you will know the results from Google on April 27th. PS: You can compare to our 2014, 2013 and 2012 numbers. Published on April 2, 2015, 6 a.m.
Weblate 2.2 has been released today. It comes with improved search, user interface cleanup and various other fixes. Fulltext search on location and comments fields. Added support for Google Analytics. Improved handling of translation file names. Added support for monolingual JSON translations. Record component locking in a history. Support for editing source (template) language for monolingual translations. Added basic support for Gerrit. Published on Feb. 19, 2015, 6 p.m. In past days, several new free software projects have been added to Hosted Weblate. If you are interested in translating your project there, just follow instruction at our website. Published on Feb. 11, 2015, 6 p.m.
After releasing Weblate 2.0 with Bootstrap based UI, there was still lot of things to improve. Weblate 2.1 brought more consistency in using buttons with colors and icons. Weblate 2.2 will bring some improvements in other graphics elements. One of thing which was for quite long in our issue tracker is to provide own renderer for SVG status badge. So far Weblate has offered either PNG badge or external SVG rendered by shields.io. Relying on external service was not good in a long term and also caused requests to third party server on many pages, what could be considered bad privacy wise. Published on Jan. 15, 2015, 6 p.m.
Weblate 2.1 has been released today. It comes with native Mercurial support, user interface cleanup and various other fixes. Added support for Mercurial repositories. Replaced Glyphicon font by Awesome. Added icons for social authentication services. Better consistency of button colors and icons. Automatic hiding of columns in translation listing for small screens. Changed configuration of filesystem paths. Improved SSH keys handling and storage. Customizable quality checks per source string. You can find more information about Weblate on http://weblate.org, the code is hosted on Github. If you are curious how it looks, you can try it out on demo server. You can login there with demo account using demo password or register your own user. Ready to run appliances will be soon available in SUSE Studio Gallery. Weblate is also being used https://hosted.weblate.org/ as official translating service for phpMyAdmin, Gammu, Weblate itself and others. Published on Dec. 5, 2014, 3:25 p.m.